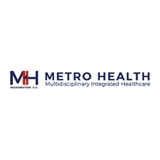 Metro Health (Washington) - Book Appointment Online! MetroHealth strives to build healthier communities, one person at a time. We accomplish this by joyfully providing high quality health services with a commitment to excellence. Our services include multidisciplinary and integrated primary healthcare, behavioral health and nutrition services. Cherry is a great professional and very knowledgable. She was very considerate and took good care of me while doing a post ER check-up.